In this article, we explain which scripts are run to configure BASH and what sort of stuff you can put in those scripts to customise your shell. When bash starts, it runs one or more scripts in order to setup the user's environment variables, any aliases, and what programs to run at startup. This post explains what scripts are involved, when they're executed, and what to put in them. What environment variables would you find in them? Envirnoment variables such as PATH get modified in ~/.profile. The PS1 environment variable gets set by the script /etc/bash.bashrc in order to make your command prompt look the way it does. You can add your own into ~/.bashrc as required. For example, you may be running some software that has different behaviour when an environment variable is set to a specific value. Such environment variables will be explained in the man page or info page for that software. Note that in these bash configuration scripts, lines that are preceded by a '#' are commented out, so have no effect. When bash is invoked, it runs /etc/profile if that file exists. Next, it looks for these files (in this order) ~/.bash_profile, ~/.bash_login , and ~/.profile. The first one that is found gets executed (any others are ignored). In the case of Ubuntu, ~/.profile is found and executed. (All of ~/.bash_profile, ~/.bash_login , and ~/.profile are ignored if --noprofile is used as an option to the underlying bash call). When you start bash but no login was required, the script /etc/bash.bashrc is run along with the script ~/.bashrc (if they exist). For example, if you're logged into your desktop and open a virtual terminal (no login required) the .bashrc scripts get invoked. (these .bashrc scripts will be ignored if the underlying call to bash uses the option --norc) For more info, see the INVOCATION section of the bash manpage. What's normally put in ~/.profile and ~/.bashrc? In ~/.profile (or one if it's alternatives: ~/.bash_profile, etc ...) you would run commands that you want to run once when a user logs in but not every time they open a terminal. 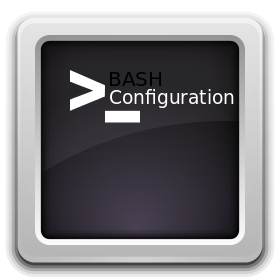 In .bashrc, one normally puts commands and configurations that you wish to make effective for a bash session. For example, customised tweaks and things that make it easier for you to use BASH as you want, such as aliases and functions. Aliases can be considered as a shorthand nickname for a specific command (plus its arguments if required). Some simple examples can be seen in the default .bashrc file in your home directory. These are pretty straight forward. All they do is add color to the grep/fgrep/egrep commands and add a few handy "ls" shortcuts to save you from entering all those options. (Note that the word alias is highlighted as a result of a search in the less command). Which would allow you to simply call untar rather than having to remember the arguments "xzvf" when calling tar. This will load the changes to your current bash session. It prompts you to confirm you want the deletion to proceed. (remember to source ~/.bashrc if you want to load the change to your current shell... subsequent shells will get it by default). i.e. searching for somefile.txt will find someFile.txt. There no need to get too in-depth with regard to bash scripting to understand how these work once you know that $1 is a variable to the function which is supplied as the argument to your command when you run it. i.e. the filename your looking for gets shoved in to the command, effectively replacing the $1.